J. S. Rowe made this science fiction art. 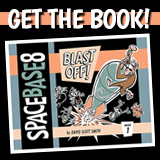 Space Base 8, simply fantastic, comical and a delight. Just finished book one and was overjoyed to discover book two. Bravo!